Organized pandemonium rules as master pianist, composer, and percussionist Mick Rossi lets fly with a set of sparklingly virtuosic mini-melodramas for quintet. Recorded live in one take, this recording offers mindblowing playing and improvisation from a crackshot ensemble ... enough to transport you to another world. The music — an extension of his previous quintet recording, They Have a Word for Everything — blurs and blends, cavorting its way through the CD, masterfully engaging the listener with familiar elements of pop coolness, cinematic suspense, heartstring-pulling divaesque showbiz, and slick cartoon hijinks. His life experiences, his experiences as a musical artist, and his experiences in the entertainment industry all combine to inform his music. 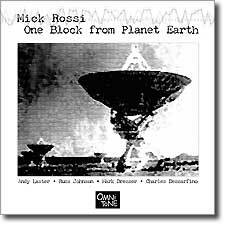 Buy One Block from Planet Earth now at the OmniTone store. All compositions by Mick Rossi, Blue Shift Music (ASCAP). Recorded live on 19 February 2002 at the Knitting Factory, New York.